This was it – the semi-final had thirty contestants which had made it through the preliminaries for the sixth annual The Woodlands Idol competition in either the first, second or third rounds – and there were high moments of excitement and disappointments. Once again the majority of song selections were country – well, okay, only a slight majority; okay… it was really close to just half and half. But you know how I feel about country music. Aside from my musical preferences, I still wouldn’t have wanted to be a judge. It had to have been tough to choose just nine of the thirty (well, twenty-eight) semi-finalists to move on to the finals in two weeks. There were several song repeats from the first three rounds, but only once by the same contestant; an error that is a disqualifying event, incidentally. Contestants are not allowed to sing the same song more than once in preliminaries, semi-finals or finals; so each person should be prepared to perform at least three songs. It took a little bit, but the next one to make it past the judges was Niki Uzell (#22) with her take on the Dixie Chicks’ “Sin Wagon.” That was the very song performed by Myi Watson a few weeks back, who unfortunately didn’t show up for the semi-finals. And even though there was a lot of great performances, I was still disappointed a few times. First of all, Jim Tillmans – who hotly crooned out “Fever” in Round 1, was the other no-show of the night. Then my other favorite crooner, Brian Kennedy (#17), didn’t make the cut with his rendition of Nina Simone’s “Feelin’ Good.” I was really sad, I liked them both a lot. I also really liked (okay, loved), Cale Reneau’s performance of “Creep” by Radiohead in Round 3, but he just didn’t hit the mark this time around with the judges when he covered Blues Traveler’s “Hook.” I get it, though, I suppose. The really fast, almost white-rap parts of that one are hard to get your tongue around. Jessi garnered all kinds of applause, shouts and screams from her cheering section, which is pretty clearly the way she got voted in – she had a huge fan-base. And as for that stage-fright I thought I detected? Well, like I said, I’m not a judge. Plus it really seemed to wear off the further into the song she got. By the end I was cheering out loud for her, too! The final round is just days away, and the excitement is palpable. I can’t wait to see who the judges pick to be named the next “The Woodlands Idol!” The choice will be tough, and I think no matter who gets in, they all deserve the accolades they’ve received throughout this competition. Come to the Finals, hear them for yourselves. Finals on Friday, November 2. All events are being held at Papa’s Ice House in Spring. Tickets are only $10 and can be purchased at the Chamber offices, by mail when you download the ticket order form and finally, at the door. The sooner you get your tickets, though, the better, as space will be limited. 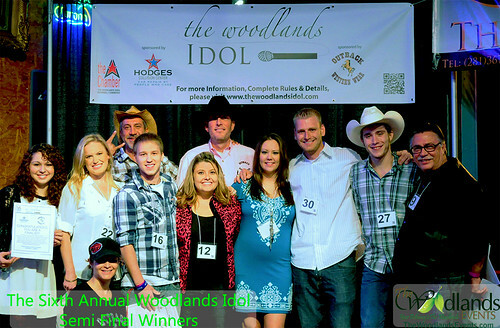 For more information about The Woodlands Idol competition, check out our Woodlands Idol page or The Woodlands Idol official site. For pictures of the semi-finals event, check out our Flikr Album.